Categories are used to group forms together. Tap Forms ships with a few built-in categories, but you are free to modify them, delete them, or create your own. Click on the Lists button. You can drag the categories up and down to rearrange them. The list of forms on the left side of the main window will update when you rearrange your categories. Double-click on a category name to edit the name. Click the + button to add a new category. Click the – button to delete the selected category. 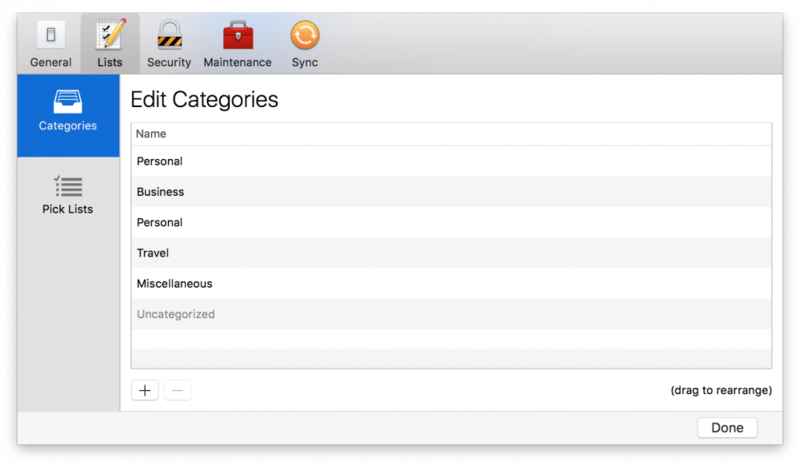 *If you delete a category, all forms which belong to that category are moved into the Uncategorized category. You cannot delete the Uncategorized category.